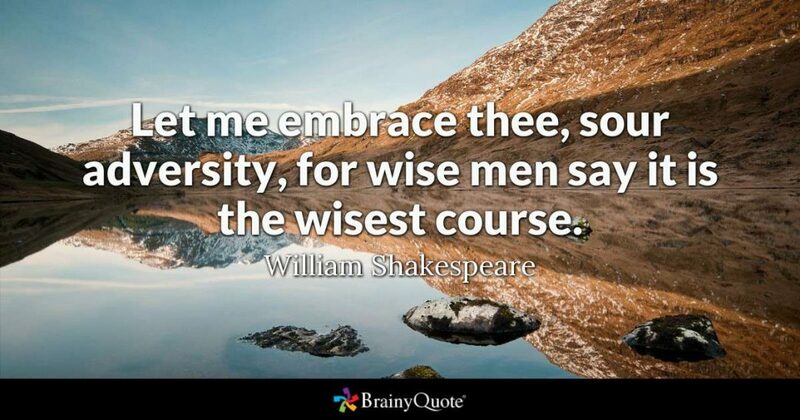 “Let me embrace thee, sour adversity, for wise men say it is the wisest course.” These words, said to have been penned by William Shakespeare, could have been written to the many disappointed supporters of State Senator Patrick Colbeck, I being one of them. We are all suffering the slings and arrows of outrageous fortune, when on the eve of August 7, 2018 we found that Senator Colbeck has come in third in a four-way race to become the Republican candidate for the November general election race to become the next Governor of the glorious State of Michigan. Alas, and it is true, so many of Senator Colbeck’s volunteers worked so hard to get the word out that he indeed was the most qualified man of the people, with bright original ideas on how to address the many problems facing our state and, in fact, our nation. Wise, gifted, Godly, thoughtful, articulate, handsome, who could have asked for more – to be or not to be – that is a question? Ah, but in the stead the winner is, Bill Schuette, a man who himself could easily be a convincing character from a Shakespearean play. Maybe like Julius Caesar, who if he were to become King would possibly mean the end of Rome’s republican form of government or Macbeth, the tyrannical ruler of Scotland who sought political power for power’s sake. “Too cruel, anywhere. Dear Duff, I prithee, contradict myself, and say it isn’t so,” as said by Banquo in Act 2, Scene 3 of MacBeth, when confronted with the fact that their royal master was gone. Ok, that was fun for a moment, but let’s end the similarity right here, because at this point, our choices are limited to two, and we have “to be” for one of them. Bill Schuette is not Julius Caesar, nor is he MacBeth. Much to my chagrin, he was President’s Trump chosen heir apparent to the throne of Michigan, and as much as we have protesteth, the end of this play must be success not failure. We must now turn our attention to Mr. Schuette and his opponent, the Democrat candidate, Grethen Whitmer (we can all breath a sign of relief that it will not be Albulrahman Mohamed El-Sayed – a backhanded victory, to be sure). Many of my libertarian-leaning friends are crying out that the establishment and the special interest crowds have won again, and no matter which of these two general election candidates wins in November, we are once again confronted with the mantra that voting for the lesser of two evils, still give us evil. There certainly is some truth to that sentiment. Both of these general election gubernatorial candidates are, without a doubt, career politicians, which to many of us is a strong indicator, if not of absolute evil, certainly of a love of big government over liberty. Nonetheless, it also cannot be disputed that when you vote for the lesser of two evils, you do indeed leave “less evil” for our children to contend with in this earthly journey that they have inherited from us. So how do we determine just who is the lesser evil (if in fact you are of that mindset)? If you examine both of these establishment candidates issues page on their websites, you will see that they are advertising that they are “the one” who can fix the roads (Ms. Whitmer insists on being a potty mouth when she talks about “the roads” – I wonder how that corresponds to her pledge to “Improving Education and Skills Training” – I thought using swear words was an indicator of a lower IQ or a lesser education). I guess we have to ask Grethen that question somewhere along the campaign trail. Both candidates claim that they will “fix the roads,” “combat or end the opiod crisis,” focus on “jobs for Michigan,” “hold government accountable,” “protect women’s rights,” “roll back or repeal a previous administrations tax plan” … blah, blah, blah. Guess what, we have heard it all before. These issues, or variations thereof, are repeated year after year, election after election, and things only seem to get worse, with more regulation, higher taxes, bigger government, to the point that it appears that these problems are similar to the cards stuffed up the card shark’s sleeve, left hidden until they get pulled out again, when they can be used to trick the honest card player into folding their hand, but now is not the time to fold in our hands. We are, once again, at a crossroad, needing to pick up the pieces, unite with elements of the same basic philosophy, work hard to explain our terms, and get out the vote in our general favor. The only question that remains is, “Will the people aligned with the republican form of government (whom I would identify as the establishment Republican, the conservative, the libertarian, the constitutionalist, and the Christian) be able to win over the progressive, the socialist, the communist, the Democrat?” In the final analysis, that is the true nature of the political battle we face – it always has been, and it always will be. I don’t think that is a line from Shakespeare, but it probably should be one.